Fun Activities at Grand Slam!! 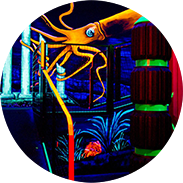 Embark on an under-the-sea laser tag adventure at our 3,800 square foot arena! 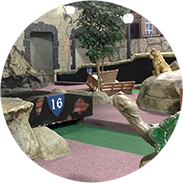 Travel back in time to the Middle Ages at our Medieval-themed 18-hole course! Calling all Ninjas! 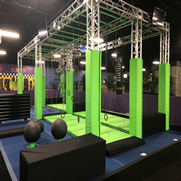 Test your strength and agility on our Ninja Course. 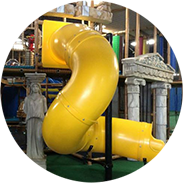 Our Roman Colosseum-themed indoor playground is the perfect place for your gladiators to burn off energy. 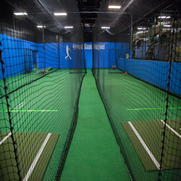 Swing for the fences in one of our 6 indoor batting cages! 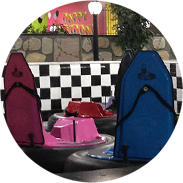 No driver's license is needed to have fun in our Bumper Car Arena! 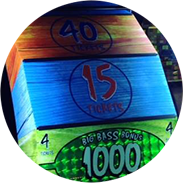 With over 50 classic arcade games to choose from, kids of all ages can rack up high scores and earn tickets to win exciting prizes. 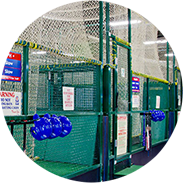 Live pitch, field grounders, or use our machines to better your skills for the softball or baseball season.